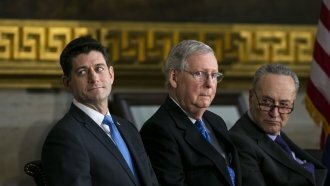 The Senate approved a key procedural vote for the budget bill on Monday, a step closer to ending the government shutdown. On Day 3 of a partial government shutdown, the Senate approved a key procedural motion to help end that shutdown and approve a budget bill. Republicans wouldn't include legislation on the Deferred Action for Childhood Arrivals program in the funding bill, while Democrats said they wouldn't support a measure without it. They struck a compromise by agreeing to tackle immigration in the coming weeks. The vote Monday limited debate on the bill in the Senate, and senators still need to approve the bill itself. After that, it will need approval from the House of Representatives.